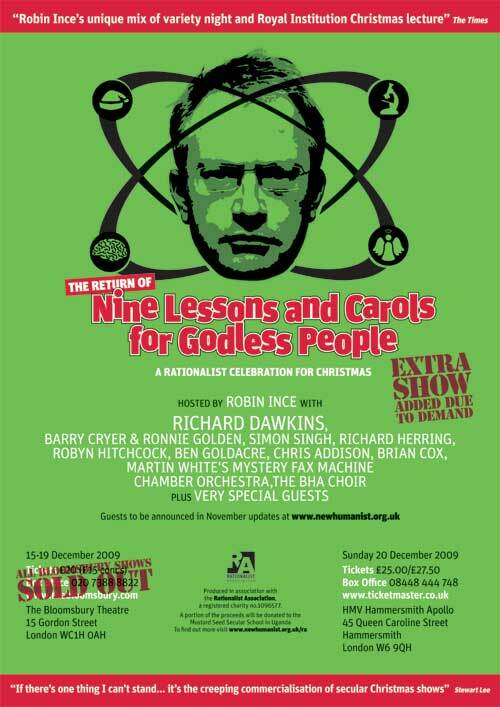 The Little Atoms 2009 extended Christmas specials recorded backstage at “Nine Lessons and Carols for Godless People”, the “Variety version of the Royal Institution Christmas Lectures”, at the Bloomsbury Theatre on 16th December 2009. The nights were curated by comedian Robin Ince, and featured a huge roster of comedians, musicians, scientists and others in a festive celebration of science and rationalism. 2009 show interviews with Andrew Collins, Brian Cox, Alan Moore, Richard Herring, Chris Addison, Johnny Ball, Josie Long, Stewart Lee and Ben Goldacre.